Window from "The White Shul", a Sheboygan, Wisconsin synagogue, c. 1910. Immigrants must reconcile sometimes contradictory impulses. Having abandoned their homes to escape repression or poverty, they often seek to recreate familiar communities in their new lands. This synagogue window is a testament to the successful efforts of hundreds of Russian Jews to recreate a familiar community in Sheboygan, Wisconsin in the early twentieth century. Most of Sheboygan's Jews emigrated from the "Pale of Settlement," an area of legal Jewish settlement along Russia's western border established in 1791. Periodic violent pogroms and more stringent restrictions on Jewish lives and livelihoods imposed in 1882 touched off a wave of Jewish emigration from the Pale. Between 1881 and 1914 two million Jews left Russia for America. The first Russian Jews arrived in Sheboygan in the 1880s. Like many other immigrants, they often followed their "landsleit" (fellow townsmen) to settlements in the new world, with the result that many of Sheboygan's Jewish immigrants came from a relatively small area east of Vilna and north of Minsk in current-day Belarus. They settled on the northwest side of Sheboygan, in a neighborhood bounded by 13th and 15th Streets, Geele Avenue on the north, and Bluff Avenue on the south. By the early twentieth century, Sheboygan's thriving Jewish community rivaled the size of Milwaukee's and supported three Orthodox synagogues, all within a few blocks of each other. Congregations initially met in members' homes, but they acquired permanent religious buildings as soon as they could. 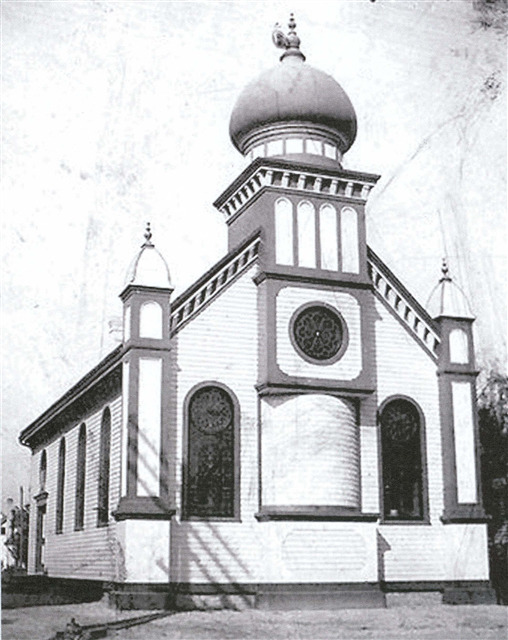 Sheboygan's first synagogue, Ahavas Sholem, was established in 1903 in what had been the first Catholic Church built in Sheboygan, St. Mary Magdalene. About 1907 the congregation of Adas Israel (Community of Israel), which had formed in the 1890s, acquired the building that became the city's second synagogue. In 1910 the congregation moved that building from North 8th Street to the southwest corner of North 13th Street and Carl Avenue, where it became known as "The White Shul." The White Shul educated children and provided spiritual sustenance for the next thirty years. But as the founding members aged, many of their children didn't feel the same connection to the Orthodox Judaism of their parents and grandparents. Membership in Adas Israel declined, and another Jewish congregation grew in its place. In 1944, the children and grandchildren of Sheboygan's original Jewish immigrants founded Congregation Beth El, a Conservative rather than Orthodox congregation. The Beth El congregation rented the Adas Israel synagogue as its headquarters and Hebrew school from 1945 until its own, newly-built synagogue was completed in September 1951. Congregation Adas Israel formally dissolved in 1953, and their building was sold to a different religious denomination, the Church of God. In the following years, the building's new owners removed most of its original architectural details, including an onion dome. But one window remained, visible only from the rear of the building on a wall facing away from the street. 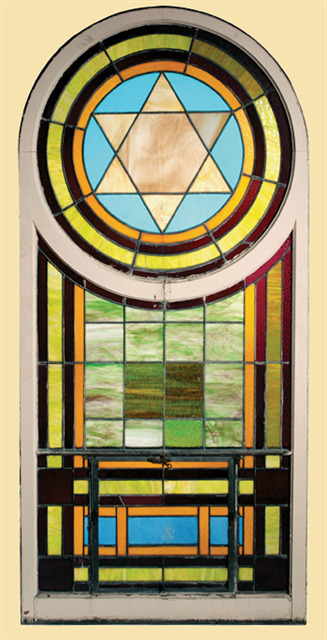 This leaded window features a Magen David pattern of colored glass set into a wooden frame. The window's maker is not known, but it likely dates from about 1910, when the building was moved to its final location. After World War II, Congregation Beth El became the center of Jewish life in Sheboygan. As late as 1960, there were about 250 Jewish families living in Sheboygan, with perhaps 1,000 members all told. In recent decades, however, that number has declined significantly. Joel Alpert explained why at a 1999 reunion of the Jewish Community in Sheboygan: "as the second and third generations became educated beyond the local job market, they immigrated to larger cities." One of these educated émigrés is Sheboygan native David Schoenkin, who now lives in New York. Like many Jewish immigrants, Schoenkin's grandfather Charles worked as a peddler and scrap dealer. He settled his family on North 13th Street, a few houses down from The White Shul. 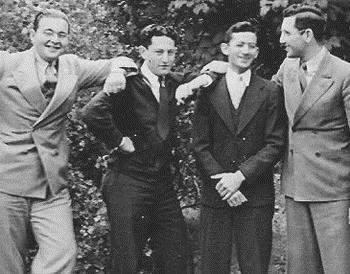 When David's father, Nathan Schoenkin, left school in the mid-1930s, he began working as a clerk at the Lakeland Manufacturing Co., a clothing factory run by the Holman family, who were pillars of the Sheboygan Jewish community. Lakeland Manufacturing and other Holman family businesses often served as entry jobs for new Jewish arrivals to Sheboygan. After serving in the United States military during World War II, Nathan Schoenkin joined his brothers, Gustave and Leo, in forming the Schoenkin Brothers Iron and Metal Co., a family scrap metal business that provided the economic stability to launch the next generation of children. On his periodic visits back to Sheboygan, David Schoenkin would pass the former Adas Israel building and notice the surviving Star of David window. In 2006, he felt compelled to preserve this reminder of Sheboygan's Jewish history. He traded a new, energy-efficient window to the current occupant of the building, in exchange for this evocative artifact. Along with his brother Charles and his sisters Kathy and Marsha, David donated the Star of David window to the Wisconsin Historical Society in memory of their parents, Nathan and Susan Schoenkin. History does not stand still. The faith of Sheboygan's first Jewish immigrants evolved in its new American surroundings, and many of their descendants have dispersed throughout the country. The White Shul is no longer a synagogue. Still, this window survives as a tangible reminder of how, as David Schoenkin told "The Sheboygan Press" in 2006, "Wisconsin opened its arms to those that wanted to build new lives and have the freedom to practice their religion."